/ Modified jul 31, 2018 4:56 p.m.
Where in the World is Jeff Flake? The U.S. Senator's trip to Africa stalls votes on Trump nominations. 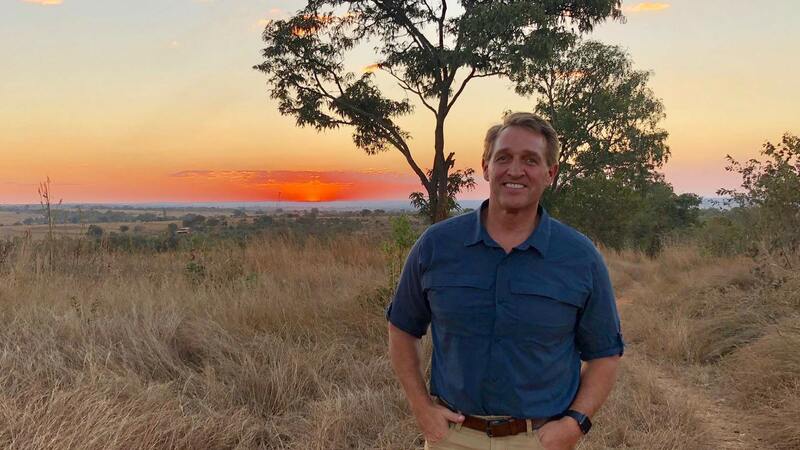 Sen. Jeff Flake is shown in Zimbabwe in this photo shared on social media. Arizona Senator Jeff Flake is in Zimbabwe, where he is monitoring an historic election, but Rolling Stone magazine suggests another motive for the Senator's trip. The article published Tuesday says Flake's absence from Washington essentially paralyzes the Senate's effort to confirm judges nominated by President Donald Trump. That's because without Flake, the Senate Judiciary Committee is down to 10 Republicans and 10 Democrats, making committee approval of Republican nominees impossible without Democratic votes. And, since fellow Arizona Republican John McCain is home in Arizona receiving cancer treatment, Flake's absence leaves the full Senate without a Republican majority. Vice President Mike Pence would have to break any 49-to-49 ties, meaning Pence can't leave Washington to hit the campaign trail until either senator returns. The magazine points out that it's not clear whether Flake is doing this intentionally. His office has not returned calls asking for clarification.